Stair fixing brackets. 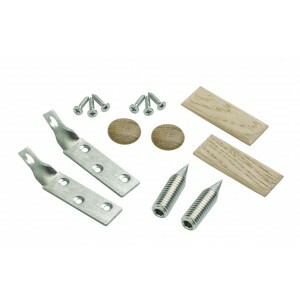 These kits include Stainless steel screws that fix a twist bracket to the underside of a handrail section. You can then easily fix the handrail in place against the newel post. Each kit contains two brackets for affixing each side of the handrail section to a newel. Richard Burbidge is renowned for the quality and craftsmanship of their stair parts. The huge range of newels, spindles and handrails will enable you to achieve the staircase you’ve always wanted. These newel fixing kits from are suitable for all Richard Burbidge stair systems except Fusion and Fusion Glass.